Let’s face it, even the most seasoned concealed carrier will sometimes find him or herself drawing a little attention to themselves and their firearms once in a while. After some time, the instances will become less frequent, but it’s good to be conscious of the things we tend to do when we first start carrying. This article is mostly for people who are new to concealed carry, or haven’t even started carrying yet. It’s good to keep these things in mind, because a lot of the time we will do them without even noticing. While many people wouldn’t think twice about seeing you do these moves, some will know why you’re doing them. Lightly touching the firearm and/or holster to make sure that it’s in the proper position is something that we all do from time to time, but it should be something that we do in private. A restroom for instance, is a great location to make any necessary adjustments. The number one time that I find myself doing this is right after getting up from a seated position. When we sit, our rig can have a chance to shift a little bit, and it may feel like it needs some adjustment when we stand up. 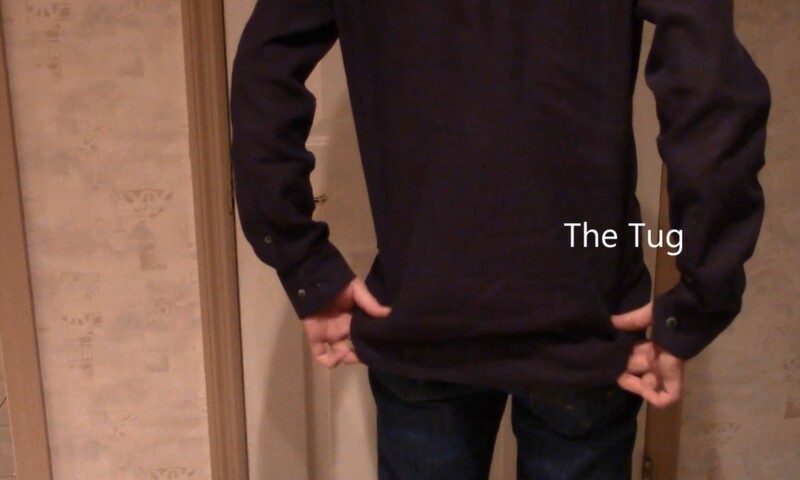 If you can, do this adjustment quickly and tie it in to the next point; the shirt tug. 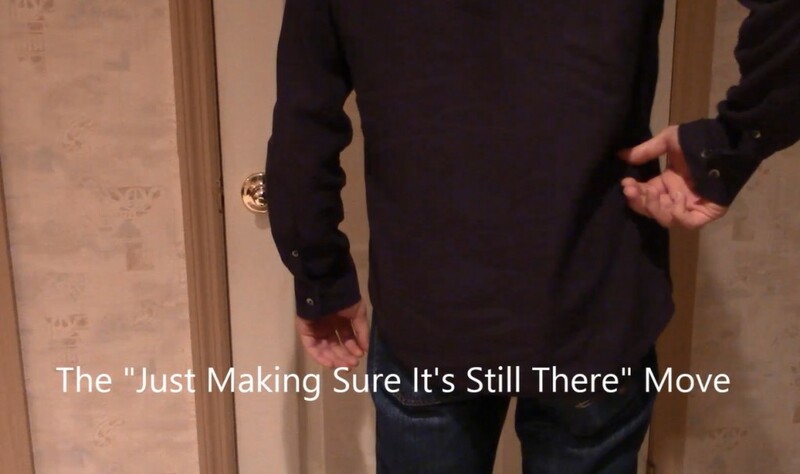 A quick tug down on your shirt to make sure that your firearm is covered never hurt anyone, but making a habit of it will draw attention to yourself and that area (right where your firearm happens to be). If you are wearing the proper clothing to cover everything that needs to be covered, there should be no reason to ‘tug’ at your shirt. An exception would be right after you’ve gotten up from a chair, in which case you may want to give your shirt a quick tug just to make sure it’s in the right spot. Again, this depends on your current outfit and will not be necessary for everything. After that however, leave it alone until you’re somewhere private. With the first two points, if your rig is really out of place, you should realize this simply by how it feels. If you carry regularly, you should be very familiar with how your rig feels during your daily activities. Especially if you’re new to concealed carry, this is something that happens often until we are used to carrying on a daily basis. It’s usually just a quick touch of the back of the firearm while it sits in the holster. It’s part ‘make sure it’s seated in the holster’ and part ‘make sure it’s still there’. It’s also part ‘unnecessary’ because if you have a proper holster, it’s not going anywhere. Some on our Facebook page even made note of the fact that they’ve been guilty of ‘resting’ their arm/hand on the firearm. Pulling up your pants is a little more difficult when you add a firearm into the mix. 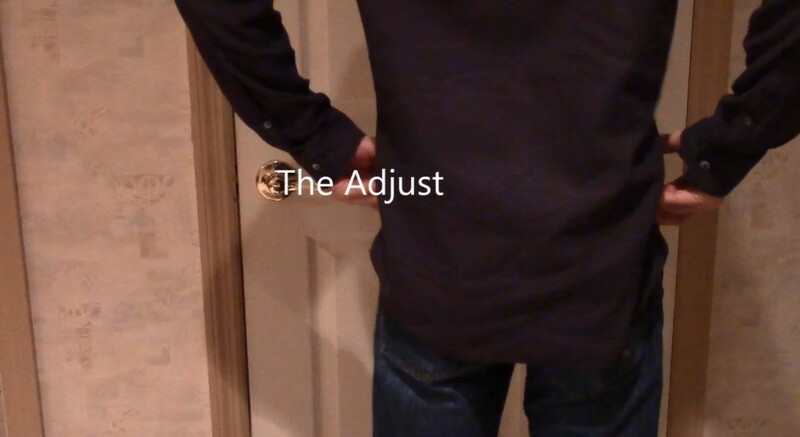 If you ever find yourself needing to lift up your belt and pants to a correct position, you may want to make a few adjustments. The first one would be to make sure that your belt is tight enough, and that you’re using a proper belt for concealed carry. Remember that you have an extra pound or two (or more) that’s being supported by your belt, so it’s important to have a sturdy belt to keep things up. I tend to put an emphasis on printing because I’m not a fan. Some think that it’s not that big of a deal and that’s fine, but I do what I can to avoid any printing of my rig. The entire point of concealed carry is keeping it concealed and unnoticed so that no one knows you are carrying. The only way to tell if a shirt is going to work is to throw it on with your rig and check yourself out in the mirror. Some of your favorite shirts may simply not work anymore and should not be worn. If you see excessive printing, it’s best to avoid that shirt and move onto another one. Or, throwing on another layer (weather permitting) may solve any printing issues. If I’m wearing a Justin Bieber shirt (I’m not, I swear), chances are I enjoy her his music. If I’m wearing a firearm-related shirt, chances are I’m a gun owner. While it may not mean that I carry a firearm, it definitely supports the thought. Be mindful of what you wear if you’re worried about being profiled, because chances are you’re being profiled. Some people will fight me day and night on this point, but I stand by my reasoning. Put it this way; if you’re at the bank with two other people and you’re the only one with an NRA hat and an “I love the 2nd Amendment” shirt, guess who the bank robber is going to watch the closest. Sure the chances are slim, but the reason we carry is so we’re prepared. This is just another step in preparedness, and it’s called blending in. For instance, if you carry on your right side, your right arm is likely to swing much less than your left when you walk. It’s a way that we protect our firearm without even noticing that we’re doing it.